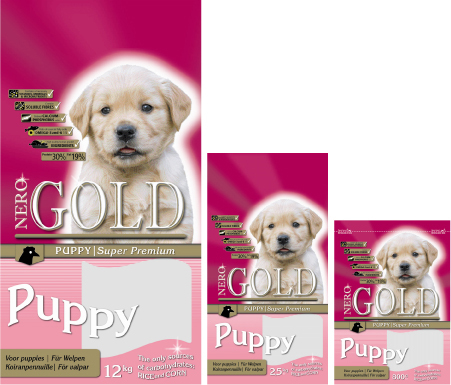 Puppies have special nutritional needs in their growing period. Balanced ratios of high quality protein, fat and micronutrients promote a stable growth and healthy development. Ingredients: dehydrated chicken, corn, rice, chicken fat, beet pulp, flax seed, yeast, carob, egg powder, hydrolysed chicken liver, minerals & vitamins, chondroitine, glucosamine, L-carnitine, lecithin, inuline (FOS), taurine. Analysis: protein 30,0 %, fat 19,0 %, fibre 3,0 %, ash 6,0 %, moisture 8,0 %, phosphor 1,0 %, calcium 1,4 %. Added: vitamin-A (E672) 20000 IU/kg, vitamin-D3 (E671) 2000 IU/kg, vitamin-E (as all-rac alpha tocopheryl acetate) 200 mg/kg, vitamin-C (as l-ascorbic acid phosphate) 70 mg/kg, E1 50 mg/kg, E2 1,5 mg/kg, E4 5 mg/kg, E5 35 mg/kg, E6 65 mg/kg.